Photograph courtesy Ron Healey from a posting at 'alt binaries pictures rail'. D5107 heading a line up of several others at Blaydon in August 1962. Still visible is the Darlington trademark of the detailing of the grilles in light grey. Also intact is the curved roof hatch for the roof mounted water filler. (See view below for the other side of the locomotive). Photograph courtesy Rex Conway collection. A view of D5107 not long after delivery seen here at Gateshead depot. The breakdown crane to the left awaits its next duty, the large brick building was once part of the lodging turn house. About the only features now left in this view are the blocks of flats in the background & these have been refurbished. 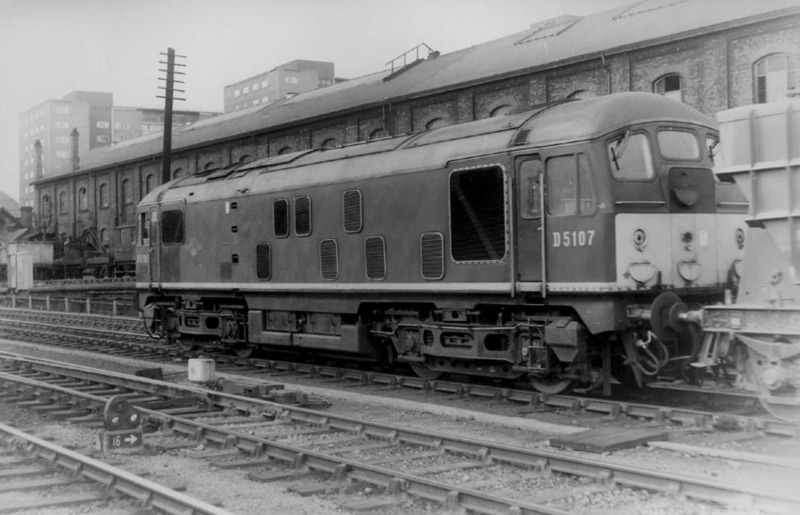 The sixteen year two month career of D5107/24107 was split between North Eastern Region and Scottish Region depots. Shortened fuel tank & full size water tank. Tyne Dock - Consett modifications (high level air pipe fitted, water tank removed). Time between withdrawal & scrapping: 6 months. October 5th 1976 - stored unserviceable. After withdrawal 24107 was stored at Millerhill from October 1976 until May 4th 1977 when it was forwarded to Swindon Works and broken up by the middle of June 1977. Movement: 24065, 24107/15/24 02.20 Millerhill-Derby-Gloucester-Swindon May 4th 1977. Noted Darlington Works January - March, May & June 1962. Noted Darlington Works December 1962 & January 1963. Noted Glasgow Works April - June 1965. Noted Crewe Works September 1966. Noted Derby Works April 1967. Noted Derby Works March 1973. Noted Glasgow Works September 1974. North of Newcastle two English Electric Type 4 turns were converted to pairs of Gateshead Type 2s, handling the 6.55am & 9.18am Newcastle - Edinburgh, returning with the 1.30pm ‘Heart of Midlothian’ & 2.25pm service. Interestingly non-boilered D5107 & D5108 were on the 6.55am diagram on December 17th! The Gateshead Type 2s were also encroaching further into the local J39 freight workings, now including the Ponteland branch. Condition August: green livery with small yellow warning panels, curved upper corners, bottom of warning panels does not completely cover the frame level stripe, shortened fuel tank, full size water tank, no blanking plates fitted, hand/footholds in place, three-rung bogie mounted footsteps, ridge sided sandboxes, steam style shedplate on cab front, cantrail water filler cover present. The recent modernisation of St Rollox Workshops led to a greater influx of the BR Type 2s, not only the Inverness based ones, but also those from Gateshead and various LM depots, early June found D5012, 5107/D5119 & D5129 under repair. Condition January: green livery with small yellow warning panels, curved upper corners, bottom of warning panels does not completely cover the frame level stripe, high level air pipe, shortened fuel tank, no water tank, blanking plates fitted, hand/footholds in place, three-rung bogie mounted footsteps. Condition August: blue/yellow livery, gangway doors present, high level air pipe, shortened fuel tank with circular gauge, no water tank, blanking plates fitted, hand/footholds plated over, three-rung bogie mounted footsteps, ridge sided sandboxes, engine exhaust in original position. A long time working ended on March 26th when the Tyne Dock – Consett iron ore trains ceased running, the last two being the 10.30am and 12noon.. With this action 24107/108/109/111 were transferred to Haymarket, their first move since arriving at Gateshead during October/November 1960, whilst the ore wagons went to store at Heaton. 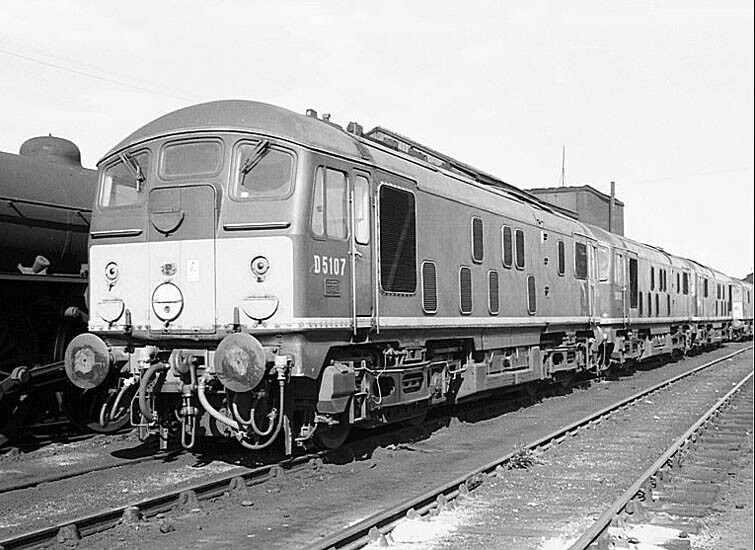 Consett was now served from the Redcar ore terminal using pairs of Class 37’s and new 100ton wagons. 40063 & 24107 were noted at Pitlochry on a freight on February 4th. On April 7th 47424 working the northbound ‘Clansman’ caught fire at Dalnaspidal. 26027 was removed from the double headed 16.35 Inverness – Glasgow Queen Street to assist the ‘Clansman’ northwards, whilst 24107 off a freight was added to the Glasgow train for the run south. 24107 was stabled on Millerhill at lunchtime on May 2nd. Photograph courtesy Tony Sayer. 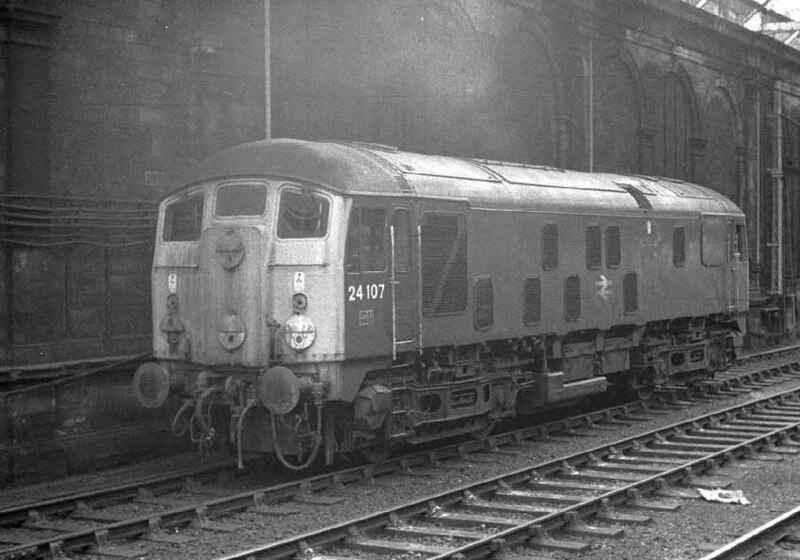 24107 at Edinburgh Waverley on June 6th 1976. 24107 was noted at Inverness on the morning of October 5th with empty coaching stock. 24107 was withdrawn on December 1st 1976 (it had been stored since October 1976). Condition March: blue/yellow livery, gangway doors sheeted over, headcode discs centered on cab front, high level air pipe, shortened fuel tank, no water tank, blanking plates fitted, hand/footholds plated over, three-rung bogie mounted footsteps, ridge sided sandboxes. Page added October 26th 2016. Last updated February 28th 2019.